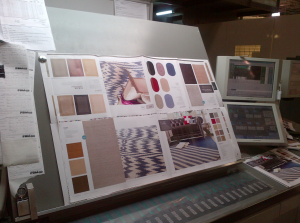 Rivers Agency kick-started 2013 with our completely original catalog design for America’s largest rug manufacturer. Since 1917, Capel Rugs has been the authority on all things rugs, and this year’s catalog is a tribute to that long-standing reputation. This 240-page guide employs engaging and constructive graphic design that inspires readers to be their own interior decorators, with mix and match patterns and helpful information about each piece. This new informative approach absorbs readers with page after imaginative page, showcasing the refined reputation that is Capel Rugs. As many Capel products bear the Made in the USA seal, the catalog speaks volumes to the tastefulness and culture of the classic American home. The brand energizing designer collection exhibits the amazing work and creativity of Capel’s talented and famous brands: Genevieve Gorder Rugs, Biltmore Rugs, Kevin O’Brien Rugs and Williamsburg Rugs. Rivers Agency copywriters had fun with this book adding detailed descriptions about each collection. We let our talents soar through brand-energizing page layouts and clever, compelling copywriting. With every fiber of our being, the Rivers Agency team sought to realize a print design that complements the brand image that Capel has maintained over the last 96 years. And we did it. The imagination and careful hand-stitched threads of Capel’s products mirror the diligent handiwork of each member of our professional team in our best catalog yet. Our branding and marketing capacities paired with the quality of Capel’s products have created a pattern for success over the years, and that’s why Capel has been our oldest and longest-lasting client. Happy New Year from the Rivers Team! Well written blog. I would love to see a copy of this catalog.